Below the orange line is the Main Navigation. 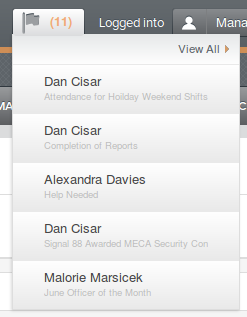 The Manage section also has a helpful Sidebar. 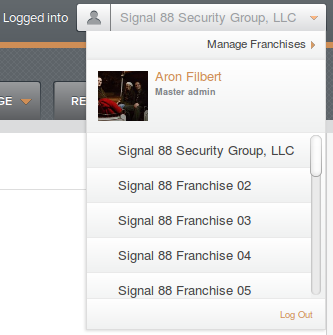 These buttons will switch the view to either Inteliguide or Patrolguide (or Salesguide, Coming soon!) 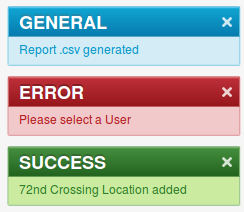 all using a single sign on solution. Login to one, and immediately access any that your account is authorized for. This is where you will find out basic profile info and can choose which Franchise Context to work in depending on if you are Authorized for more than one Franchise. 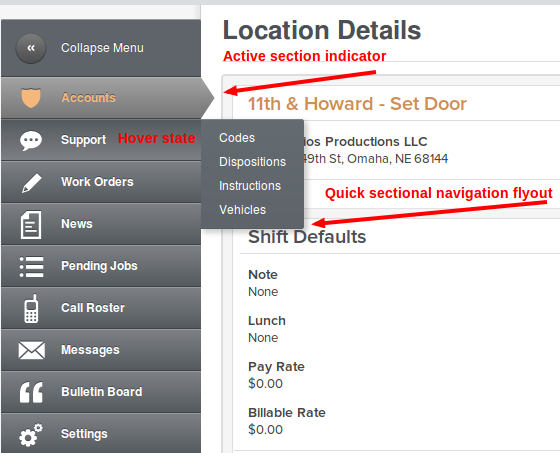 The area below the orange horizontal line and the gray horizontal line contains the main navigation for the app. This may vary depending on the app. Shown is Inteliguide. General - For background process completion or file generation, etc. There can be one or more notifications stacked on screen at once, some will persist where necessary, and others will fade away after several seconds. These are a way to navigate within discreet sections. Take Accounts, for example. As to be expected, the Plus symbol '+' means Add and will take you to the Add New form for the item in question. 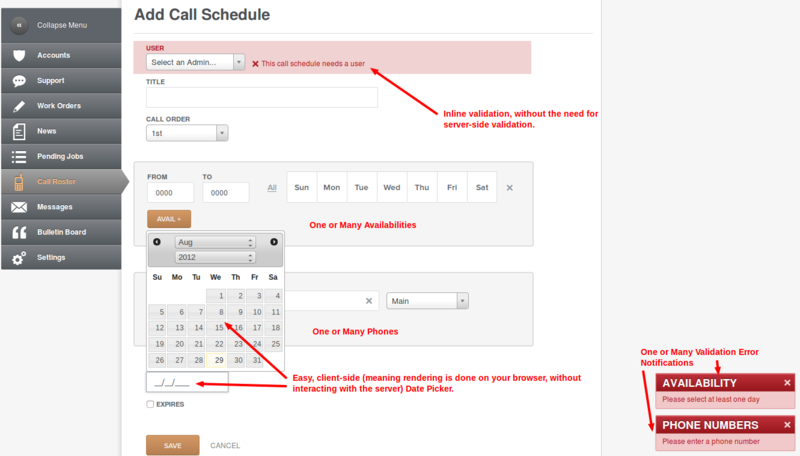 In the example, Businesses, Locations, Groups, or Users. 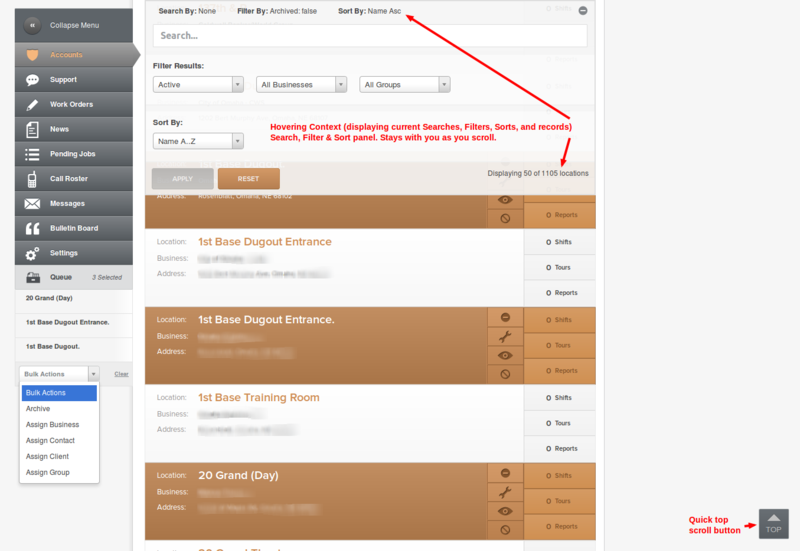 All of the elements that you'll use to interact with the app will be consistent and uniform throughout. In designing the new 2.0 interface for the web, we kept mobile and touch interfaces at the back of our mind nearly every step of the way. Many operations features will be accessible via mobile apps, but nearly all of the features of the web app (used through your browser, instead of your phone or tablet; for instance) will be easy to navigate via the mobile browser. This resource represents a comprehensive description of all the tools and features of Inteliguide & Patrolguide for web and mobile. It does not represent walkthroughs on how to specifically achieve certain goals. Rather, it examines all the individual elements of the applications and explains how they correlate. 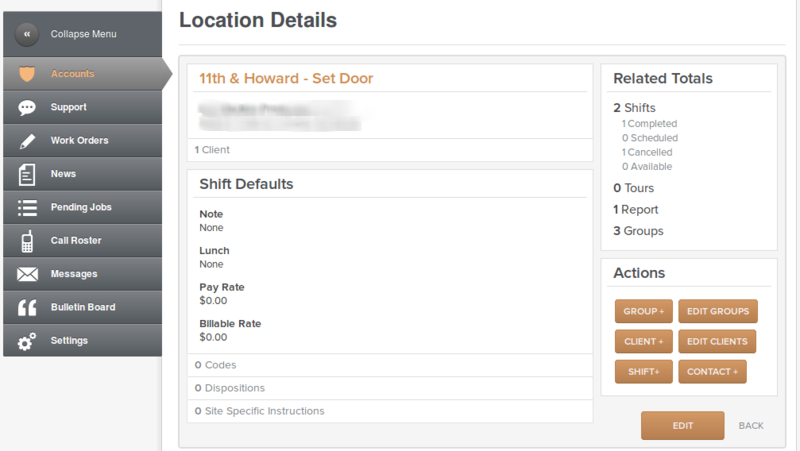 Using the information found within, constructing walkthroughs with specific goals (How to create your first Shift, or Patrol Work Order, or export a Client Report to CSV, for a few examples) will be extremely easy. In explaining how different elements and features interrelate, there are a few passages that resemble walkthroughs... but that was in the service of delivering a deeper understanding of those respective issues. Beyond this documentation, there is a public Announcements portion of our Knowledge Base. We are going to start with a walkthrough for Clients, to ease the shock of their transition from the legacy system to V2, and we will be posting that to Announcements. That will be available by the middle of our beta testing period just as we start transitioning over real Clients to the new system. Looks fantastic! Incredible work, guys!!!! Just saw you on A&E's site for Be the Boss! That's awesome that you're featured there. Looking forward to the episode, and we're working hard to get V2 all tested and ready to go. Getting close! Thank you thank you :)... Its actually quite embarassing as its not me at my best lol... but it was worth it :).. Cant wait for V2.. hurry up already lol... Any date in mind? I'm never me at my best if there's a camera pointed at me. Much respect to you for having the courage to put yourself out there. We're really striving for the first week of the new year to do field trials. Gonna be demoing things at the convention for sure! Speaking of. I need to nab my flight tix. Yeah.. dont like camera's much myself... lol.. just wait til you see.. I did a bit more than just put myself out there lol.. it'll be hysterical. Good on the first of the year... are field trials open because I'd like to try :)? We're going to be conducting them in person for the first trials, I'm going to be riding along on Patrols, standing by while payroll is ironed out, and other things... afterwards, the FG Corporate office will have a phased roll out to groups of markets. That's the plan, anyway! We'll get this stuff out to you just as soon as it's ready. The last thing we want, however, is to prematurely release a product that make's everyone's lives more difficult. This stuff needs to be bullet proof! We're doing everything we can to make it so. Just gotta push through the last tail end of it. It's always the polish work that gets so exhausting and time consuming. Looks great Aron! Great seeing you at convention and looking forward to V2! Heyyyyyy.. wheres my beta lol??????????????? You should have had access since about 8PM on sat. Did you try and log in yet? Whatever s88 email address you use to access legacy IG (and password) should work. We took a snapshot around 8PM on the 16th, so use whatever credentials you had then to access the beta. Yep found it.. just wondering about Patrolguide now... we used to be able to access the admin side of patrol guide to enter site specific info (tours per week, client instruction , etc. ).. When I log into PG now, its only showing the actual start for patrols. SO.. my question is.. where is the screens to the PG side of the house when scheduling tours? Is that located in IG now? Browse through the Tips & Tricks for a lot of quick pointers on where you can find things you're looking for. Community help has a LOT of info that you can peruse as well. Additionally Admins can't access Patrol Work Orders yet... we're pushing a fix for that momentarily. EDIT: This has been resolved.